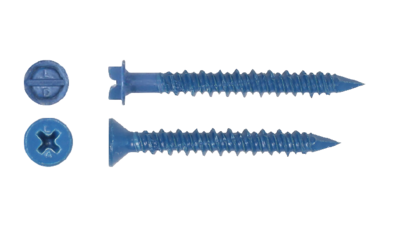 Masonry Anchors are a range of fasteners designed specifically for fixing into concrete. 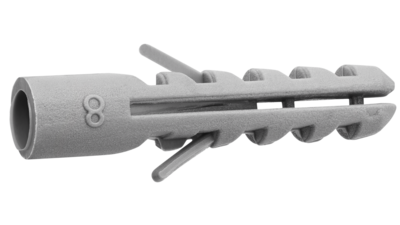 The most common type of masonry anchors are Sleeve Anchors, Flush Head Sleeve Anchors, Wedge Anchors, Nylon Ram Plugs and Drop in Anchors. 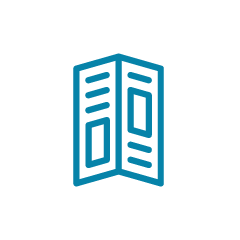 All work by expanding inside a pre-drilled hole. We also have Mushroom Head Spikes and Concrete bolts. 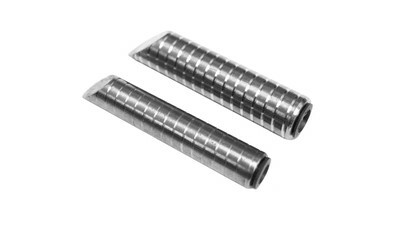 As an alternative to mechanical anchors chem-set studs are also available which are glued into pre-drilled holes. 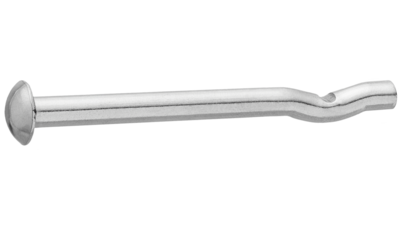 The Sleeve Anchor consists of a central bolt with an expanding cone shaped taper similar to a trumpet at the base end, a split sleeve which fits over the bolt and is expanded by the bolts taper, a flat heavy washer and a hex nut. 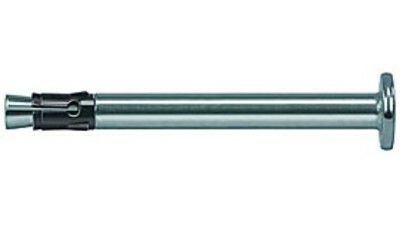 The bolt size is always one size smaller than the sleeve, identified by the nominal diameter of the sleeve by total length. 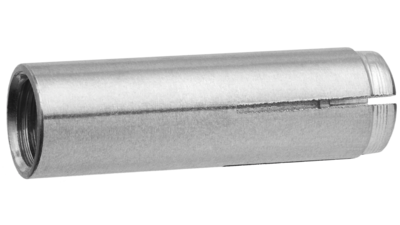 Available in metric sizes from 6.5mm diameter to 12mm and in lengths from 40mm to 100mm. 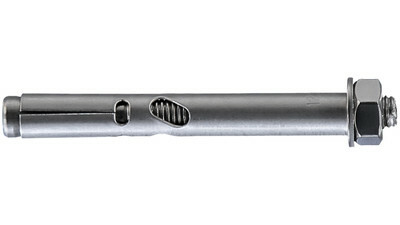 The Flush Head Sleeve Anchor is similar to the sleeve anchor but instead of a bolt and nut it uses a hex bolt which screws into a cone nut at the base of the split sleeve which as the bolt is tightened draws the cone nut up into the split sleeve expanding the sleeve against the walls of the pre-drilled hole. 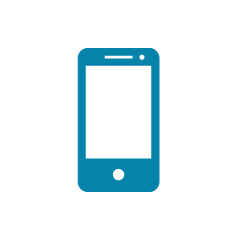 Again it is identified by their nominal diameter x overall length. 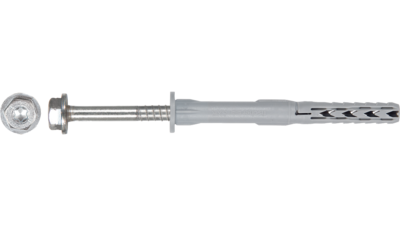 The Wedge Anchor also known as a true bolt (because the thread size is the same as the true nominal diameter of the sleeve) uses a shorter sleeve that doesn't have a split. 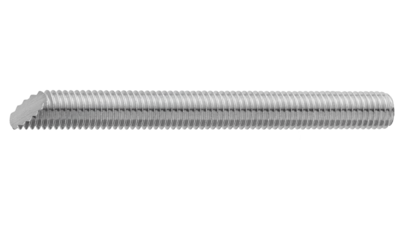 Available in metric sizes only from 10mm to 20mm in diameter and in length from 75mm to 160mm. 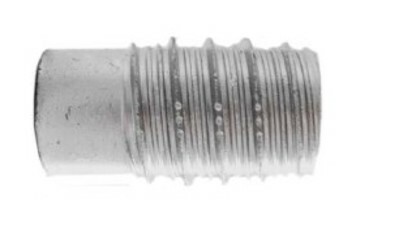 A Drop in Anchor is a internally threaded barrel with a split base that with the use of a drop in anchor setting tool expands inside the pre-drilled hole, and can then have a bolt, machine screw or cap screw screwed into the thread. Available in metric size threads only in 316 grade from M6 to M16. The Spike or mushroom headed spike has a flat domed shaped head and is similar to a nail, only it has a blunt tip and a kink in the lower half of the shaft. 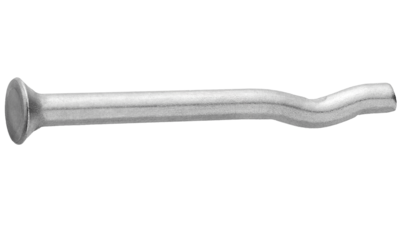 Designed to be hammered into a pre-drilled hole, the kink is wedged into the hole and provides the holding power. 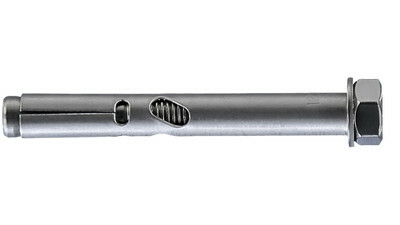 Not designed for heavy applications where a sleeve anchor may be more appropriate. 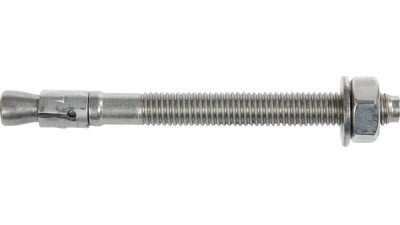 Concrete Bolts can be hex headed or countersunk socket drive, with a hardened and very course thread that is screwed into a pre-drilled hole in the masonry. 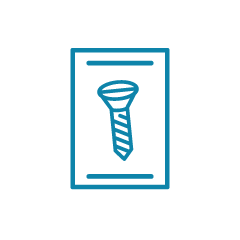 Concrete bolts are identified by their head shape, nominal diameter and length. 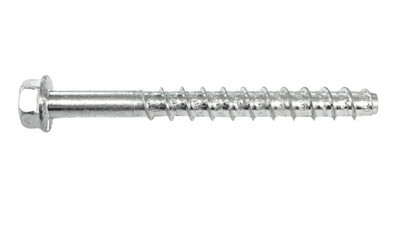 Fischer Screws are made up of two parts the nylon sleeve and the CO-NA screw which has a unique shank design which when tightened expands the nylon sleeve in four directions, while the maximum diameter of the screw is situated exactly in the position of the bearing point. 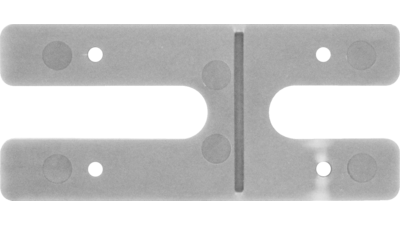 Available in two head types, countersunk torx drive and HWF torx drive, Fischer screws are approved for use in concrete, solid brick, solid sand-lime brick, hollow block made from lightweight concrete and multi-layer composite concrete walls. Used for fixing railings, handrails, gates, door frames, windows, facade and roof substructures made of wood and metal. 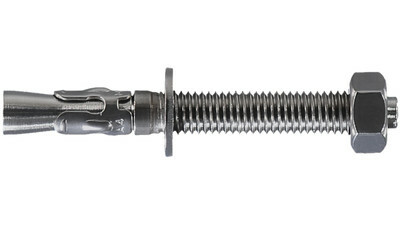 For more technical data on the performance of the Fischer Screw click here.